Comment: Is Jose Mourinho the man to solve the Paul Pogba puzzle? When Paul Pogba reads through this season’s Player of the Year nominations, he might just wonder whether or not his agent was bit hasty to claim he will stay at Manchester United until he wins the Premier League title. So-called super agent Mino Raiola made the bold statement in response to the latest round of suggestions that all was not well between Pogba and United manager Jose Mourinho. But when Pogba sees that it is becoming a straight fight between Kevin De Bruyne and Mohamed Salah to be crowned the Player of the Year, he might begin to question whether or not he can hang around too long at United while Mourinho is in charge. In his second season after returning to United for a then world record £89million fee, Pogba should be in the running for all the biggest individual awards by now. Part of the problem is, however, that Pogba does not run enough – he strolls. He was meant to be the man to lead the Mourinho revolution, the player to show that United are still capable of going toe-to-toe with Europe’s biggest hitters. But it is two of the Special One’s rejects who are leaving the France international behind. Mourinho allowed De Bruyne and Salah to leave Chelsea, having barely played either of them, much to the annoyance of everybody at Stamford Bridge. Both men were not trusted to do the dirty work. There was no doubting their ability to hurt the opposition, but Mourinho is not a manager to let his players off the leash and the frustration became too much for them to bear. At the moment, Pogba appears to be going the same way. The signing of Alexis Sanchez means the 24-year-old cannot be allowed to stray too far from the centre of park and abandon his defensive duties. By the end of the first half at Selhurst Park, Pogba was walking back to the dressing-room deep in conversation with referee Neil Swarbrick having felt he had been given some rough treatment. It looked like he just wanted somebody to blame, somebody to point the finger at for yet another uninspiring 45 minutes. Sky pundit Gary Neville left viewers at home in no doubt who he held accountable, saying: “His great weakness is that he plays like he's playing in the park with his mates. “It's like everything he does is like a YouTube or Instagram video. It's like it's not serious, it's like a joke to him in terms of the way he goes about things. 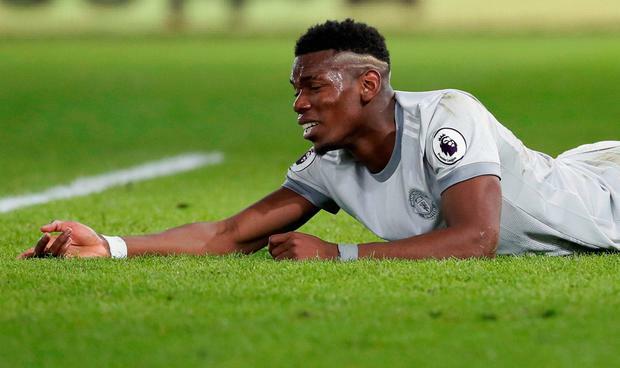 Pogba had floated one free-kick straight out of play and was accused of diving by the Selhurst Park crowd after going down in the penalty area under a challenge from Aaron Wan Bissaka. Once Marcus Rashford replaced Scott McTominay at the break, Pogba had even less licence to push on from a sitting role next to Nemanja Matic and he immediately gave the ball away to Palace’s first-half goalscorer Andros Townsend. De Bruyne and Salah can pretty much roam anywhere for Manchester City and Liverpool, but Pogba, despite his price tag, is not afforded that luxury. Having seen Patrick van Aanholt extend Palace’s lead, the former Juventus star tried his luck from 35 yards by driving the ball straight down the throat of goalkeeper Wayne Hennessey. It was desperate stuff. When Sanchez was penalised for pushing into James Tomkins before he could get on to what had looked like a superb pass from Pogba, United’s number six looked towards the technical area as though he wanted some sort of encouragement for his efforts. He forced a good save from Hennessey with a curling shot, but, despite United’s fightback to get all three points, Pogba looked miles off Player of the Year material – just as De Bruyne and Salah had during their time under Mourinho.